This brand new cardboard cat furniture line is taking modularity to a new level! Katris from the design team at Papercut Lab, is a system of sturdy cardboard shapes that fit together just like the shapes in the game Tetris, allowing you to create an endless number of configurations. 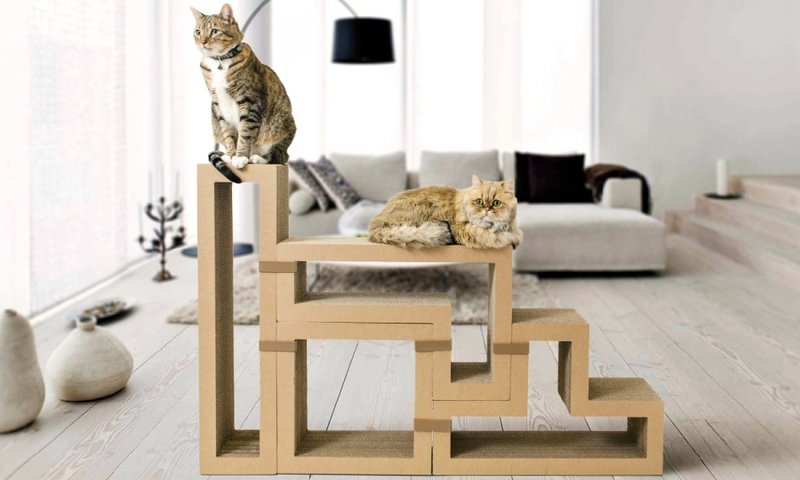 By stacking and attaching the pieces, you can build a customized cat tree that doubles as a scratcher or even a piece of furniture for you. Make a side table or coffee table with nooks and crannies for the cats to explore. Special clips are used to hold the modules together once you’ve created the perfect design. What I love about this is that you can change it periodically to give your cats something new to explore. Brilliant! Think of the possibilities! You can build up and out in any direction, and the end result looks like a piece of modern sculpture.